At Rapid Web Services, we are very happy to announce the launch of the Grinnall Cars website! Grinnall Cars manufactures specialised sports cars, trikes and kit cars, from the Scorpion III, IV to the BMW 1200CL. I would be lying if I said they did not look like tempting purchases! For Grinnall Cars, Rapid Web Services put together a custom web design which was then integrated into a custom developed website. 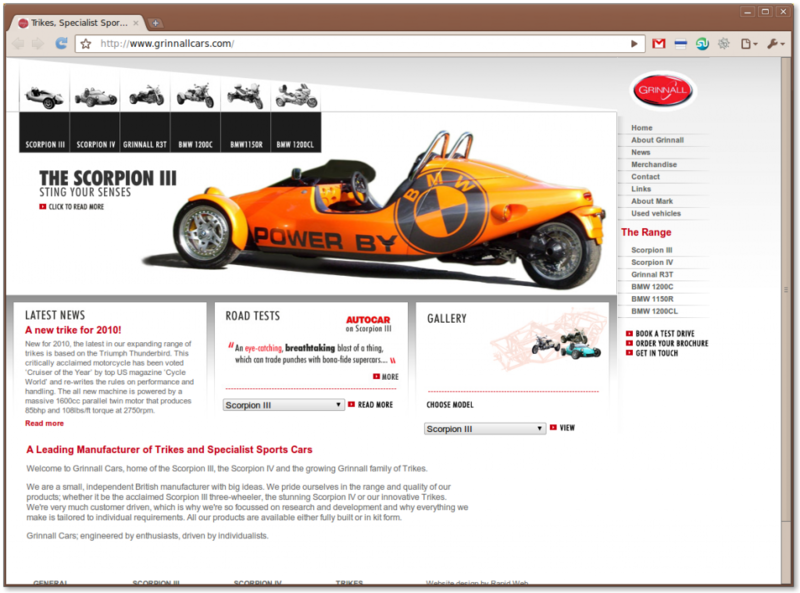 Each product featured on the Grinnall Cars website, has several related information pages and a full dynamic photo gallery. The Grinnall Cars homepage also features a custom made Flash banner, created by one of our excellent in-house Flash developers and previews several of the top products from Grinnall Cars. The Flash animation features many aesthetically appealing visual effects such as focus blur which compliments the design and provides additional promotional information without overly distracting the end-user. If you are interested in website design, development or Flash animation development, please feel free to browse our portfolio – Grinnall Cars being one of our newest additions! If you wish to, please feel to get in contact with us and discuss exactly what you’d like!